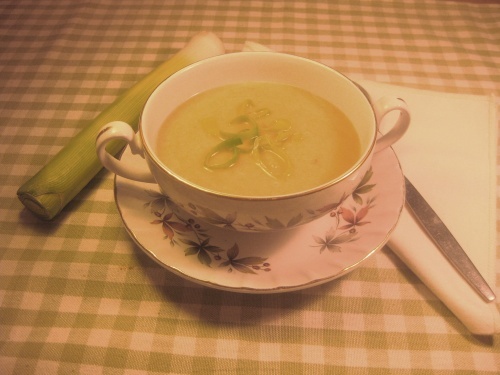 In January I like to give you a recipe for soup to warm you on cold winter days. This one uses the vegetables we have readily available and are not expensive. Cut off the roots and coarse green tops from the leeks and wash the leeks thoroughly. Cut a few thin slices from the tops for garnish later if you like. Slice the leeks and chop the onion. Peel the potatoes and cut into 1in (2.5cm) dice. Melt the butter in a large saucepan and cook the leeks, onion and potatoes for a few minutes. Add the stock and bay leaf then simmer until the potatoes are soft. Purée in a liquidiser or with a blender until smooth, add the milk and season to taste. Soften the reserved leek slices in a little boiling water then drain them. Serve with this garnish sprinkled on the top and a swirl of cream if you like. Note: In the hot weather this is nice served cold and is then called Vichyssoise.